el traçat de les lletres, difuminat com molsa. en un instant etern, com colibrís que beuen. en branca fugint del teu foc moll que em llepa. the shape of their handwriting, all blurred, like moss. for an endless instant, like humming-birds drinking. to branch to escape from your wet, licking fire. den Schwung der Handschrift, verschwommen wie Moss. einen ewigen Augenblick lang, wie Kolibris, die trinken. zu Ast auf der Flucht vor deinem feuchten Feuer, das mich leckt. Anna Aguilar-Amatwas born in Barcelona in 1962. She has a PhD from the Universitat Autònoma de Barcelona where she now teaches at the Translation Faculty She published several specialised texts in that field and other subjects as minorized languages, knowledge engineering, divergent thinking, etc. She came to the foreground of Catalan poetry when she was awarded three of the most prestigious literary prizes for her books Trànsit entre dos vols (Transit between two flights, 2001), Música i escorbut (Music and Scurvy 2002), and Petrolier, (Oil Tanker, 2003). She has also published the book of poems Coses Petites (Little things), and a book of essays El plaer de la lectura (The pleasure of reading, 2004).Her fourth poetry book is Jocs de l’oca (The Goose Games, 2006). 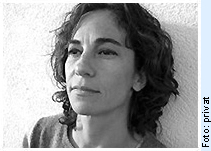 Her poetic work is present in several anthologies of Catalan poets and she has been translated into Spanish, English, French, Italian, Sardinian, Macedonian, Finnish, Arabian, Turkish, Greek, German and Slovenian. She was included in the Anthology New European Poets by Wayne Miller & Kevin Prufer, Minnesota 2008. Since 2003 she became president of QUARKpoesia, a non-profit group affiliated to the Translation Department of the Universitat Autònoma de Barcelona and the cultural organization 'Cultura en Viu', whose main purpose is the promotion of lesser-known poets and writers in less translated languages, as well as the exchange of ideas and poetic works. In 2006 she founded the poetry publishers Refraccions (Refractions) with the aim of publishing bilingual or trilingual poetry books.